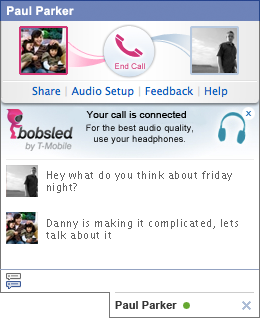 In a slightly puzzling move, T-Mobile has released a Facebook app that enables friend-to-friend voice chat. It’s called Bobsled (or more properly, Bobsled by T-Mobile, as it will remind you at every step in the process), and it addresses the 88% (according to their study) of Facebook users who want voice chat built into the site. Being one of the other 12%, I can’t say with certainty whether this app is what people were thinking of, but at the very least it looks well integrated. Once you install the app (at the dynamically-named letsbobsled.com), a little phone will appear by online friends’ screen names (those who have the app installed, anyhow), and after that it’s just one click away, with confirmation on the other side of course. It’s powered by Vivox. It’s part of an emerging messaging and communication platform that’s making its debut with the Sidekick 4G, and is related to the Cloud Text service, a GroupMe-esque reply-all texting service. Presumably they’ll be adding something like cross-service compatibility, so that you can text people via Facebook message, or some similarly tortuous method of contact. 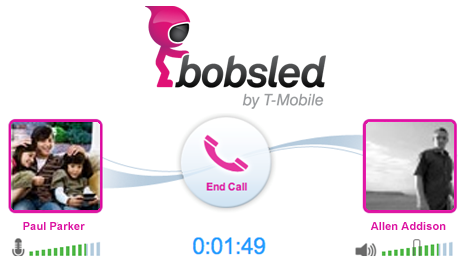 There are plans for the “near future” to include video chat, as well as “the ability to place VoIP calls to mobile and landline U.S. numbers, and will offer applications on smartphones and tablets across various mobile platforms, regardless of the carrier that powers such devices.” So Bobsled is T-Mobile’s wedge in the video chat world, an answer to Facetime and Skype that’s carrier-operated and can easily be included on T-Mobile-branded devices like the G-Slate and G-series phones. I haven’t tested it out, but it’d be hard to mess this up. It looks like this first step was taken mainly because it was the easiest (just branding a licensed service), and the meat of the program will show up later. At that point, as it grows more complex, I suspect it may be a little less straightforward to use, and competing apps that are more universal and less carrier-associated won’t make it easy for them, either.